I will always remember this place as the spot where I met my favorite Australian opera teacher/jazz musician. I had never met her before nor have I seen her since. But at La Petite Reine, that doesn’t matter. Just behind Geneva’s main train station, it serves as the gateway to the popular Grotte neigbourhood. Nestled between a bicycle parking structure and the city-run bicycle rental store, La Petite Reine (that’s the French nickname for the bicycle) is a wonderful little café with a beautiful sunny terrace that faces south-east, a great place to meet strangers and make friends of them. 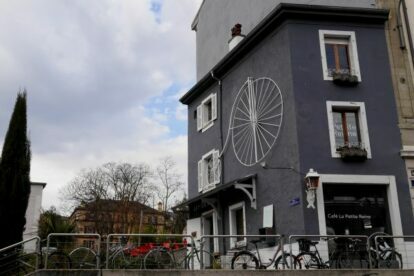 The building in which the bar is located is tiny but friendly and also hosts DJs, acoustic concerts, exhibitions, and as they themselves like to say, “unusual activities”. The bar serves local beers (with or without Picon), various snacks, great Italian sodas (I am a fan of those) and some nice cocktails. People who ride bicycles or name their bar after them are inherently good people and La Petite Reine reminds me of it every time I spend an amazing evening there.